Babylon-Enterprise for Smartphones provides secure access to critical enterprise information, supporting today’s exceedingly mobile workforce. Mobile sales representatives can get current data regarding customers, orders and inventory in a single click. Field support engineers can get information while en route to customer premises, and review previous service data with customers during their visit. 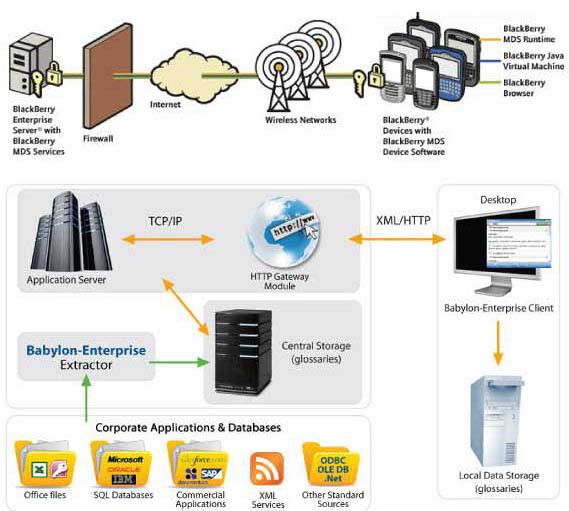 Babylon-Enterprise for Smartphones delivers current and vital enterprise information no matter where you are. With the intelligence of your back-office systems on your Smartphone, you can monitor business performance, respond quickly to opportunities, and make well-informed decisions. Based on the renowned Babylon-Enterprise information access solution, Babylon-Enterprise for Smartphones brings data from business applications to the mobile user’s productivity environment in a single click. Enables your company’s mobile workforce to be more efficient and productive in their jobs while leveraging your organization's existing infrastructure and applications. Extend the reach of your organization's existing infrastructure and applications without having to replace or redesign them. Accelerate and make more informed decisions. Keep your mobile workforce and executives connected to the critical data in your company’s enterprise applications. Improve productivity while on the move – turn downtime into productive time. Babylon-Enterprise is an information delivery system that gives users instant, single-click access to information that resides in disparate enterprise systems and sources, such as ERP, CRM or HR databases, enterprise portals and other knowledge management systems. Babylon-Enterprise extends the reach of organization’s backend systems by providing a simple and speedy way to deliver information to users who might not otherwise access these systems.Introduced just a few years ago, Babylon-Enterprise has already been implemented by numerous industry-leading customers worldwide, totaling over 300,000 users. The convergence of desktop and enterprise applications has resulted in measurable benefits for these organizations: employees get critical information easier and faster, without switching applications, and while remaining focused on their work.Babylon-Enterprise for Smartphones now brings the same business benefits to mobile users. Babylon-Enterprise’s patented single-click technology creates a direct bridge between the desktop and the enterprise applications, enabling instant and effective information retrieval. Babylon-Enterprise is an integrated client/server system, comprising a desktop client and a web application server that communicate using industry standard protocols (XML/HTTP). The Babylon-Enterprise client for Smartphones is a native Smartphones Java application designed to work on Smartphones smartphone running OS 4.5 and above and connected to the Smartphones Enterprise Server with Smartphones Mobile Data System (MDS) services. The Babylon-Enterprise client is integrated with other Smartphones applications, such that a click on any text in an application produces a contextual query that can be sent to the Babylon-Enterprise server.